CANNA COCO is a line of nutrients and substrates which are specially developed for growing plants in coco. CANNA COCO was the first cultivation product line for coco. Nowadays it's the most popular growing product line for both professionals and hobbyists. Thanks to the special characteristics of coco substrate CANNA COCO doesn’t have a Vega and Flores variant. Instead, there is one unique formulation for both the growth and blooming phase. We can’t make things easier! 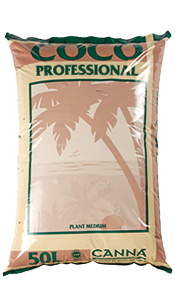 CANNA Coco Professional is a natural coco-based plant medium that offers the gardener and his plants advantages in comparison with other substrates. It's an organic product that is free of diseases. 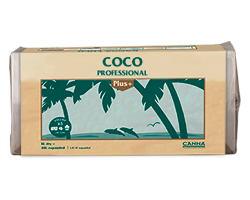 The buffering is not as heavy as CANNA Coco Professional Plus, meaning you have more control over the buffering process. 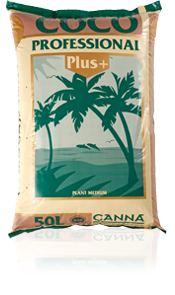 CANNA Coco Professional Plus is a coco-based growing medium that offers the gardener and his plants many advantages. Amongst other things, it contains a special mould that protects the plant against soil diseases. And it is very easy to use! The CANNA Coco Professional Plus Cube is the exact same high quality, washed and buffered medium that CANNA is known for but in a compressed form. A specially designed hole causes the cube to expand faster than you have ever seen before. The packaging is in fact a bag in which the cube is designed to be soaked or wetted. When you dilute an acidic product, always add the acid to the water, never add water to the acid, if it splashes it will cause burns on your skin or in your eyes! Want to know more about CANNA COCO? In this Infopaper we explain everything you want to know about growing plants in coco. 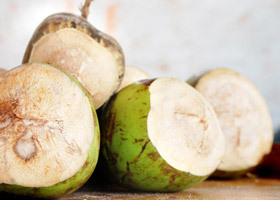 Growing on coco is the most popular method for both professionals and hobbyists.